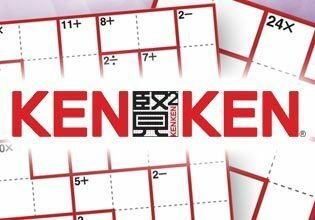 KENKEN is available in a variety of sizes and challenge levels. Universal Uclick is offering puzzles that consist of either a 4x4 (easy) or 6x6 (challenging) grid of boxes divided into 'cages' marked by bold outlines. As in sudoku, all numbers (1 through 4 in an easy puzzle or 1 through 6 in a challenging one) must be used without repetition in each row and column. The difference is that all numbers in each cage must combine, using the denoted math operation, to produce the target number in the top-left corner.